For the past few years, just before they both exploded, my two favorite non-Derek Jeter baseball players have been Mike Trout of the Los Angeles Angels and Clayton Kershaw of the Los Angeles Dodgers. In fact, during a failed attempt at a baseball league in which the rosters would carry over from year to year I took Kershaw with the top overall pick and a still-in-the-minors Trout in the third round. My favorite t-shirt of the past half decade has been my “Kershaw 22” Dodgers T while my favorite jersey is my “Trout 27” Angels one. Given that the World Series ended a few weeks ago there is probably a fair chance you are wondering why I’m now talking about my favorite baseball players. Well, it’s because my guys just so happen to be the best two in the game today. This isn’t opinion – this is fact. 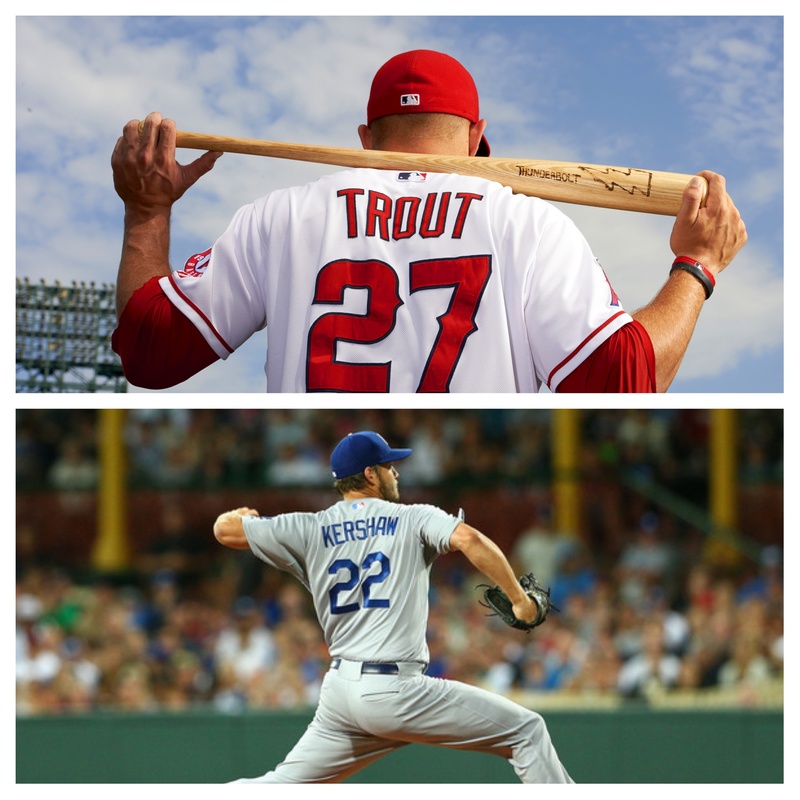 Earlier this evening Mike Trout and Clayton Kershaw each won their first MVP awards for the AL and NL respectively. For Trout this award was a long time coming. He arguably deserved the MVP crown two years ago and by all measures should have won last year’s award over Miguel Cabrera on both accounts. He has put up numbers and displayed skill in the game that leads everyone to come to the same conclusion – Mike Trout is the best batter in the game since Barry Bonds and Alex Rodriguez, only without steroids. If he continues to play the way he does now he won’t just be a hall of fame player, he will be one of the ten to fifteen best to ever play. Oh, and he’s 23. That’s right, Trout is only three years my senior and is already far and away the best positional player in the game today. Kershaw, meanwhile, is coming off his third Cy Young win in four years. Kershaw has been the most dominant pitcher in baseball for the past half decade and picked up the MVP – the first time an NL MVP has been awarded to a pitcher since 1968 – in what may be his most dominant season yet. Postseason struggles have prevented Kershaw from adding titles to his quickly evaporating mantle space, but given that he is just 26 this will most likely change before his career ends. I’m just proud of my guys. Watching each of them play is like getting to view a work of art. Trout is a defensive mastermind with a swing of gold. Seeing him in person remains one of my happiest moments as a sports fan. Kershaw is a dominating force that destroys the human will of the batters he faces. I was fortunate enough to see him pitch against the San Francisco Giants at home a few years ago in San Francisco. Kershaw struck out 13 in one of the most destructive outings I have seen in my lifetime of baseball fandom. It remains the best game I’ve ever seen a pitcher deal in person. Turns out that the west coast was the most valuable this year. Two of the brightest stars the game has seen in some time are playing out in the southwest and today we get to appreciate how much better they have made the games. Here’s to you Mike and Clayton.